With a sky-lighting burst of flame and thunder, a Boeing Delta 2 rocket boosted a $1.2 billion infrared telescope into space early today, a "great observatory" designed to detect the feeble glow of infant planets, stars and galaxies in the making. In so doing, NASA's Space Infrared Telescope Facility, or SIRTF (pronounced SIR-tiff), will complement the work of the Hubble Space Telescope and the Chandra X-ray Observatory while extending humanity's vision into a realm that, until now, has been shrouded in dusty mystery. "The technical capability of SIRTF will most likely lead to discoveries that no one could predict before the start of the mission," Lia La Piana, program manager at NASA headquarters in Washington, said earlier this year. "SIRTF will significantly increase our understanding of the Universe and will probably re-write astronomy textbooks just like the Hubble Space Telescope did." Once safely in orbit around the sun, its instruments activated, checked out and chilled to a few degrees above absolute zero - a process that will take up to three months to complete - SIRTF will be the most powerful space-based infrared observatory ever built. So sensitive, in fact, it would be capable of detecting the pulse from a TV remote control "clicker" from a distance of 10,000 miles. "SIRTF will be a factor of a hundred to a million times more capable than any previous facility for infrared astronomy," said Michael Werner, SIRTF project scientist at the Jet Propulsion Laboratory in Pasadena, Calif. "I'm fond of saying that SIRTF doesn't just meet our requirements, it exceeds our requirements. It's going to be very, very exciting over the next months and years." Running four-and-a-half months late because of booster issues and the launchings of two Mars rovers this summer, SIRTF's Delta 2 finally roared to life at 1:35:39 a.m. EDT (0535:39 GMT) Monday, swiftly climbing away from pad 17B at the Cape Canaveral Air Force Station. The fiery exhaust from the vehicle's powerful Delta 3-class solid-fuel boosters lighted up the night sky for miles around, putting on a spectacular show for area night owls. Fifty minutes later, after two firings by the Delta 2's second stage motor, SIRTF was released into an orbit around the sun designed to maximize the spacecraft's science output. Engineers were not initially able to acquire telemetry from the spacecraft as it sailed high above Australia, causing a few tense moments following SIRTF's separation from the Delta 2's second stage. But as it turned out, all was well. "I have no nails left," joked project manager David Gallagher. "We had a little extra delay there acquiring (telemetry) from Canberra. 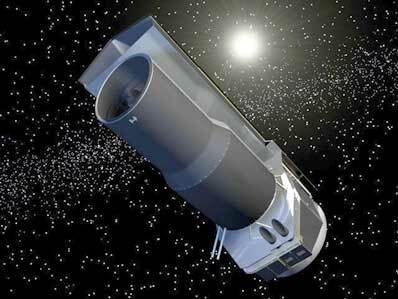 We have done a preliminary assessment of the subsystems of the observatory and everything looks to be good. We are pointing where we should be. "We believe, this is very preliminary, the cause of the delay was that the signal was too strong. ... We are getting telemetry down now and everything looks good." Launch came two full decades after the project first got underway with an official "announcement of opportunity" from NASA. "We were all foolish enough not to notice it was actually Friday, May 13," said George Rieke, a principal investigator from the University of Arizona. "Somehow we have overcome, after two decades, the bad aura that came with that particular date." The victim of budget cuts and resulting redesigns, SIRTF survived primarily due to the innovation and determination of the science team and the engineers charged with turning the dream into reality. "We used to count the time to SIRTF's launch in decades," Rieke joked. "If we'd known how many decades, we probably would have quit." The key was figuring out how to reduce the weight of the telescope to permit launch on a low-cost Delta while maintaining the same mirror size, the same orbital lifetime and the same capability to chill the observatory's instruments to within five degrees of absolute zero. The solution was as elegant as it was simple. Instead of encapsulating the telescope in a massive liquid helium dewar, or thermos, like earlier, more modest infrared telescopes, engineers decided to launch SIRTF at room temperature. Once in space, a smaller dewar holding 95 gallons of liquid helium will begin cooling the optical system and instrument detectors. But that alone was not enough. To achieve the ultra-low temperatures required to detect the faintest targets, SIRTF was redesigned to operate in the shade of a single fixed solar panel that will always remain pointed face on to the sun. Finally, the SIRTF designers changed the mission profile, putting the telescope in an orbit around the sun instead of Earth, far enough away to eliminate infrared emissions from the planet or the moon that otherwise could wash out the feeble radiation from deep space. All of that, plus the addition of the largest, most sensitive digital detectors ever built for an infrared telescope, represents "a great advancement in the state of the art for infrared observatories," Gallagher said earlier this year. SIRTF is equipped with three science instruments: A powerful CCD camera sensitive to shorter infrared wavelengths, a light-splitting spectrograph to study the chemical composition of the telescope's targets and a multi-band photometer that will gather pictures and spectrographic data at longer wavelengths. "The only real downside to this warm-launch architecture is it hasn't been done before," Gallagher said. "So this is a first of a kind demonstration of that. I believe after it's successful, this will become the way you do infrared missions. By not having to cool such a large volume, the mass savings, and therefore cost savings, are quite extraordinary." Slowly falling behind Earth in a slightly longer orbit around the sun, SIRTF will focus on the faint heat emitted by stars and planets in the process of coalescing from swirling clouds of dust and gas. The 1,900-pound observatory also will probe the chemical composition of enigmatic brown dwarfs, would-be suns that lack sufficient mass to trigger nuclear ignition, and peer through intervening clouds of dust to map the hidden heart of the Milky Way. Closer to home, SIRTF's chilled 33.5-inch mirror and a trio of sensitive detectors promise to give astronomers an unprecedented view of the outer reaches of our own solar system, where uncounted comets and icy chunks of debris slowly swarm about the faint flicker of the distant sun. Of more cosmological significance, SIRTF will peer into the depths of space and time, capturing the faint glow of the first infant galaxies emerging in the aftermath of the big bang as well as emissions from the cooler outer regions of black hole-powered quasars. "SIRTF will allow us to probe the young Universe in ways which compliment the work that's been done to date with Hubble and with Chandra, the other great observatories," said Garth Illingworth of the University of California-Santa Cruz. "We're looking now to try and shed light on the mystery of galaxies, when they were born, how they were assembled and how they've grown over the life of the Universe." It's a tall order. Figuring out how galaxies evolved in the aftermath of the big bang birth of the cosmos "is really and truly one of the great quests of the next decade," Illingworth said. SIRTF is the fourth and final member of NASA's "Great Observatories" program, following the Hubble Space Telescope, the now-defunct Compton Gamma Ray Observatory and the recently launched Chandra X-ray Observatory. The idea was to build a fleet of space-based telescopes sensitive to different regions of the electromagnetic spectrum because "many cosmic objects produce radiation over a wide range of wavelengths," said NASA science chief Ed Weiler. "It's important to get the whole picture." The Compton Gamma Ray Observatory, which ended its mission in 2000, was built to study extremely violent processes, catastrophic stellar detonations and collisions generating temperatures greater than 1.8 billion degrees Fahrenheit. Chandra studies slightly less powerful million-degree X-ray processes like the enormous heating of gas and dust sucked into ravenous black holes. The Hubble Space Telescope is primarily a visible-light instrument, sensitive to the radiation emitted by stars, galaxies and interactions that generate temperatures measured in the thousands of degrees. SIRTF is optimized to capture infrared emissions from objects and processes that generate temperatures of a few hundred degrees or less. Editor's Note: Portions of this story were originally written for The Washington Post.